If you can't beat 'em...join 'em! Go Hoosiers! We haven't really seen any rainy days, but the truth is we've been stockpiling the toilet paper rolls for this craft since Christmas when we got a cool art project book from Santa. So, Sunday, we tackled the project and the girls had a blast! Cut semi-circle card stock pieces that can fold and make cones for the castle tops. Staple to close securely. The girls are using this as their 'jewelry' display for their pasta necklaces and valentines day rings and such they have been collecting. They were so proud to show off to Daddy! Addy--the more abstract artist of the two! Lilly--focusing in on the details and asking LOTS of questions! 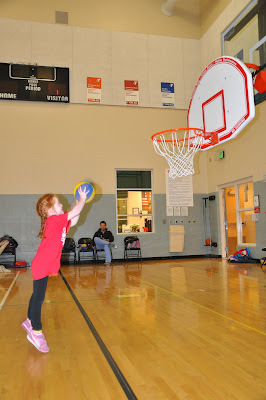 March Madness of a different type: Guest Blogger: Daddy! Basketball is a deep ASH tradition. My uncle Mike played for LC in the late 70's. My grandfather, Wild Bill McColly, played for Ball State as a 4 year starter in the early 50's then was an assistant coach for the famous Bill Green at Marion High School in the early 70's. Uncle Chris, Uncle Joe, and I played from the time we could walk and have great memories of back yard games. Aimee and I watch Joe win a state title as a starting shooting guard his senior year when we first started dating. The three of us still play a consistent game on Wednesday nights. It's in the blood! 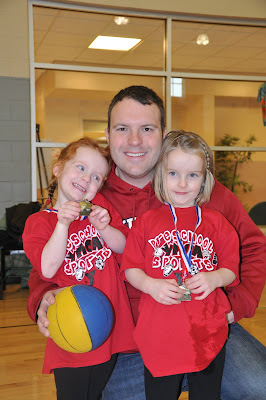 With that said, it is my fatherly duty to make sure and introduce Addy and Lilly to the game. 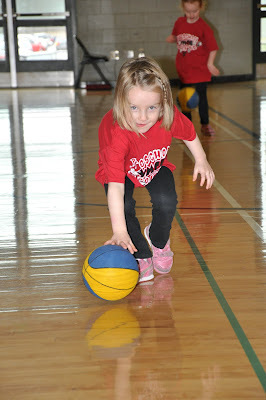 Regardless of how challenging the game is to learn, I'm bound and determined to help them figure out how to dribble a round ball, coordinate their arms and legs to work together to throw a ball into a hoop four feet over their head (it's at 6' feet height at this age), and to get into a defensive stance. 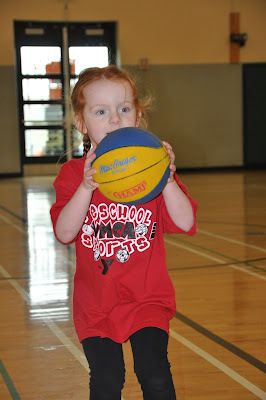 The YMCA offered a 3 year old "daddy and daughter" introductory basketball clinic for 5 weeks. Yes, I know they are 4, but let's be realistic, statistics show that the older kids in a class always dominate sports and the stats were proven again. We also knew they weren't quite ready for the 'league' play that starts at 4 years old. Uncle Chris came four weeks in a row and mom substituted the last week (wearing high heels). 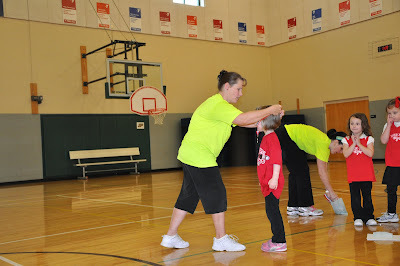 It was a great success and the girls had an absolute blast. I love how at this age they learn something new and are committed to it. We've shot hoops every warm day since the clinic started and even brought the "jordan jammer" inside to shoot in the living room. 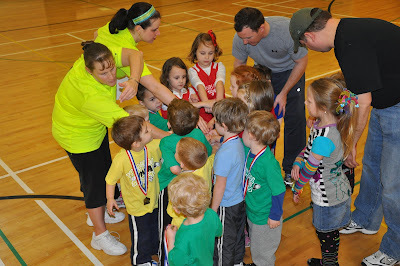 They are both extremely competitive with each other and this will lead them to learn and excel in any sport. Let's be honest...it's really all about the medals and the hot dogs that came at the end of the clinic season! Lilly, totally focused just wanting to impress her daddy! All in for final team cheer!